Stockton Duathlon; 2nd overall: An unplanned, late edition to the calendar the Stockton Duathlon seemed like too good of an opportunity to turn down, which unashamedly I’ll admit was due to rare chance to race for some prize money. However the 4hr round trip was less appealing so I managed to convince a friend Rob Bridges to give it a go and even got him to do all the driving (sneaky – JE). After the 1st 10k run, I came into T1 in 3rd place with Rob Bridges and one other. A mechanical caused me some issues on the bike but I came into T2 in 3rd place and even though 2nd was well over a minute ahead (and out of sight), I managed to pass them with about 1k to go. So all in all, a slightly frustrating race where I left with that ‘if only’ feeling, but not a bad result considering the circumstances (and still a good bit of prize money to ease the pain). Horwich (500m – 40k – 9k run with a difference); 2nd overall: Horwich has probably become one of my favourite races of the year. I first did it last year and was really happy to win in a good strong field. It has the relaxed feeling of other local races, but usually attracts a few strong triathletes to the challenging and unique course. After the 500m pool swim, the 40k bike goes straight up and into the hills along sections of the Ironman course, shortly followed by a very steep 9k run up to the top of Rivington Pike and then straight back down. I was in the last swim wave. Rob Bridges was also racing again and we left the pool at the same time. As we climbed out of Horwich town centre, I pulled away from Rob and few others and spent the rest of the 40k bike alone. I was fairly confident I was at the front of our wave, but also knew there were some good guys in the earlier wave. The run is pretty much an uphill climb for the first mile or so before it levels out and you get sight of the pike. I’d forgotten how hard the run was and could really feel the lack of time spent on two feet over the last couple of months. Credit to the race organisers though, who decided to make it a bit harder than last year by letting us run directly up to the pike rather than looping up and around via the less vertically challenging path. Once you’ve got to the top it’s a case of letting the legs go and trying to fly back down into Horwich as fast as possible. Post-race, I was pleased with how things had gone, but had to wait until the evening for the results. I’d gone a ‘whole 1 second’ quicker than my winning time last year, but an incredible bike ride from Brian Fogarty won it for him by about 16 seconds. Brian’s bike split was the best part of 4minutes quicker than my own (4 minutes quicker than his own and everyone’s else’s last year), which included some very strong cyclists. So sometimes you just have to hold up your hands and accept that they’ve smashed it on the day! 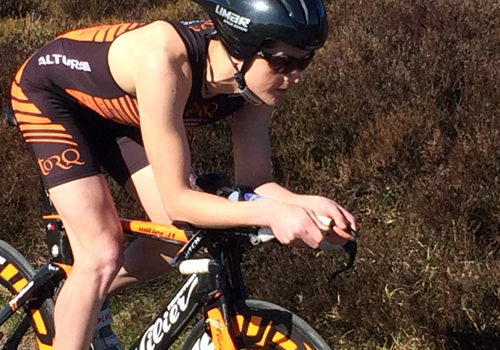 British Sprint Champs (750 open water swim – 21.2k bike – 5k run); 4th overall / 2nd in age group: 17th May was the first big championships triathlon race of the year and had attracted a strong field as expected. I’d hoped to achieve a medal in the age-group, which should translate into a good overall placing, ideally in the top 3. The swim was pretty chaotic and crowded until 300-400m and I think I could’ve tagged on the back of a faster group with a better start. I exited the water in 10:37 and out on the bike was in a group of 4/5 others which stayed together for the x4 laps around the lake and clocked a 31:04 for the bike leg. Going out onto the 5k run, I was about 6 seconds behind one of the other guys from this group, and this gap was maintained as we passed a few others and moved up the positions. The run was a 2 looped out and back circuit and by the 2nd lap I knew I was on for a 2nd place in the age group. Unfortunately I couldn’t close the gap to the guy ahead which placed me 4th overall on the day. So it was a decent race, coming away with silver for the age group, but slightly disappointed to miss out on the top 3 overall. Despite being only in May, I’ve already clocked up 7 duathlons/Triathlons this year, with 5 coming in the last 7 weeks, so I’m now already enjoying a nice bit of consistent training time (plus a short holiday) until the next set of races in June. This includes back to back Olympic distance races at the Northwest Champs (Southport Marine Lake Triathlon) on the 15th, followed by the English National Champs (Dambuster) on the 21st.